Today's carefully chosen coffeehouse (well, only one or two left unvisited on Andy's master map) is oh so very Woodbridge. 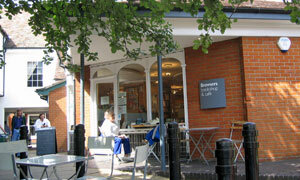 For this is Browsers, the bookshop which doubles up as a cafe in a baby Borders fashion. Cast your eye over the ever interesting selections that adorn the display tables, then park yourself for some tiffin and a latte. This, dear reader, is what Kenneth Clark meant by Civilisation. There's unsubstantiated talk of savoury offerings if you're early enough: don't count on it. Best to grab a sarnie elsewhere, maybe from the Sandwich Shop at number 17. Come for the books, stay for the cake. Both me and G. chose the carrot cake from Mrs Macd, and boy it was good. They serve a mean cup of coffee, too, with quality oomph. Feel free to peruse today's paper (lot of Guardian readers in here), pay a little extra to check your email using their single PC, or ask to use their free WiFi. Why not get Bluetooth-ed up and treat the place like your own home office, as per road warrior Cassy? And there's a sprinkling of tables outside. That'll be all boxes ticked. If it was a car -- VW New Beetle. If they were passing by -- Jasper Fforde.